The conflict in eastern Ukraine is at a stalemate. How do we break through it? Pisky, Donetsk, October 2017. Photo: Michael Forster Rothbart / Zuma Press / PA Images. All rights reserved. Political scientist Serhiy Kudelia has studied the conflict in Donbas since its very early stages. In a recently published academic article, “Institutional Paths to Ending the Donbas Conflict”, he discussed the possible approaches to ending the war. Maria Lipman talks to Kudelia about the current state of the conflict, as well as the prospects for, and impediments to, its resolution. This interview originally appeared on Point & Counterpoint, PONARS Eurasia. Maria Lipman: In your article, you describe various elements of conflict resolution that can be applied to Donbas. You point out, however, that what you describe is not a policy nor policy recommendations, but rather guidelines for a possible policy drawn from empirical studies of other conflicts. So my first question is: on which empirical studies did you base these guidelines – on which countries and conflicts – and how applicable might those experiences be to the Donbas case? Serhiy Kudelia: Most of the studies that I examined were quantitative studies based on the large sample of armed conflicts since World War II. They look at a broad range of variables that may affect post-conflict stability, from the terms of the negotiated agreements to the strategies for ex-combatant reintegration and civilian reconciliation. When we think about conflict resolution, we have to conceptualize it as a multi-stage process. The first stage is about finding a suitable compromise to which both parties would agree and taking steps to increase the probability of reaching such a compromise. A number of studies looked at the role of the balance of powers between the different parties that are involved in the conflict and how that balance of power affects the type of compromise that can be reached. The second phase is about ensuring post-conflict stability and improving the parties’ capacity to prevent conflict from recurring. The relevant variables for thinking about this phase are the type of autonomy guarantees a region receives or the types of power-sharing mechanisms designed for a particular group, the roles of ex-rebel parties and their position in the post-conflict setting, and the extent to which individual insurgents are reintegrated into civilian life and receive guarantees that they will not be prosecuted after the settlement. Finally, the third phase is about reaching a longer-term reconciliation on the societal and individual levels. It requires finding a way to allow remembrance and ensure some accountability for the crimes committed by both sides during the conflict without triggering renewed hostility and confrontation within the society. Kudelia: There exists in the conflict resolution literature the concept of a “mutually hurting stalemate,” which means that the costs of continued conflict – either in terms of lost lives or material losses – continue to rise for all parties involved, while the prospects of winning, and hence the gains associated with victory, are increasingly dim in the perceptions of all sides. This is one of the conditions for jumpstarting talks to end the conflict. We are clearly seeing a stalemate in Donbas, since the contact line has not moved significantly since February 2015. For some time now, there has also been a realization on all sides – in Kyiv, Donetsk, and Moscow – that the conflict is not going to go their preferred way. 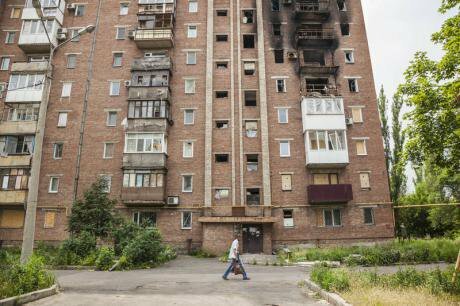 Summer 2015: shelling continues in Donetsk suburbs. Photo: Celestino Arce / Demotix. 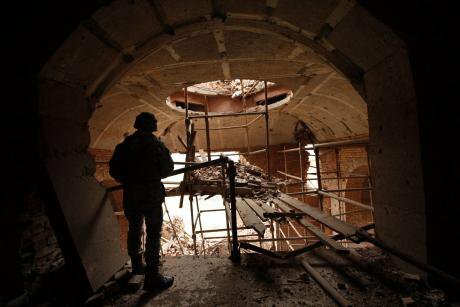 All rights reserved.Ukrainian troops will not be able to retake separatist-controlled areas with a military push; Western sanctions will not be sufficient to crush Russia or change its policy; the rebels will not take back Sloviansk and Severodonetsk; and the rest of southeastern Ukraine will not rise up in solidarity with the Donbas separatists. None of these outcomes, which many envisioned as likely at the start of the conflict, now seem remotely realistic. It is less clear whether this stalemate is equally and sufficiently costly for all sides. It certainly imposes tremendous costs on the civilians in the region. However, Ukrainian ruling elites seem to have found ways to benefit personally from increased military spending and restrictions on trade with separatists, so the costs for them are primarily political. Poroshenko’s failure to achieve progress in finding a resolution to the conflict is a major liability in the presidential campaign set to begin later this year (the election is scheduled for March 2019). Similarly, the costs of conflict for the leaderships of the two separatist republics, which are completely isolated from public opinion, are minimal. Finally, continued economic sanctions against Russia are certainly taking their toll, but they are no longer linked only to Donbas. Thus, Moscow’s concessions on Donbas would not guarantee the immediate lifting of sanctions. In my view, this lack of a sense of urgency on all sides is one of the main obstacles to starting serious talks right now. This may change if, let’s say, the new Ukrainian leadership realizes that without ending the Donbas conflict they may lose power very quickly. Similarly, if separatist leaders realize that an ongoing conflict increases the risk to their lives, it may change their calculations. (At least a dozen leaders have been killed or died unexpectedly since the beginning of the conflict.) Finally, in the case of Russia, if Putin realizes that, without credible progress in Donbas, the sanctions will only increase and there will be no possibility of a breakthrough in Russia’s relationship with the West, he may be more open to intermediate solutions. But we are not there yet, as I certainly realized when writing this paper. However, the availability of an alternative to stalemate is also critically important for policy-makers in starting serious negotiations – and academics should be the ones generating new ideas about such alternatives. Kudelia: In the case of a secessionist conflict, conflict resolution requires answering a number of central questions. One question is what the distribution of power and areas of responsibility between the central and regional governments will be once the conflict is over: how will government structures be organized locally? The second question is what the future of those who participated in the conflict on the rebel side will be – not only the insurgents who were fighting the Ukrainian army, but also the people who participated in separatist governance, people who handled local administration or provided public services (doctors, schoolteachers, etc.) How can they be reassured that their livelihoods will remain intact? And the third question has to do with a long-term guarantee that the negotiated agreement will remain in place and that the Ukrainian authorities will not unilaterally revise the terms of this agreement by reneging on the promises that they made to the people of the region. So these are three very important questions that I think need to be addressed when we discuss the specific terms of the compromise. As far as the first question is concerned, there are two types of power-sharing agreements. The first, on the national level, provides a region with certain guarantees of representation in the executive and legislative branches. The second offers expanded powers on the local level, giving regional government additional areas of responsibility. In my view, the first type of power-sharing would be very destructive for the future of the Ukrainian state. There is no question that if Donbas receives certain representation quotas on the national level, then this will be used to subvert state policies, sow discord, and paralyze decision-making. An alternative compromise arrangement offering the region de facto or de jure autonomy would not be as destabilizing. It would not mean turning Ukraine into a federal state – remember that Crimea has autonomous status according to the Ukrainian constitution, yet Ukraine has always been a unitary state. And broader regional powers would certainly address some of the key concerns of people in Donbas regarding their cultural rights: the right to receive education in Russian, the right to maintain their own historical memory policies, or even the right to maintain regional cross-border ties with Russia. One of the key problems with the creation of this kind of autonomy, again drawing on the political science literature, is that these autonomous entities tend to create what some scholars call “segment states.” Reliance on their own exclusive institutions solidifies a sense of regional identity, and these institutions may later be used by local elites as instruments for separatist mobilization. 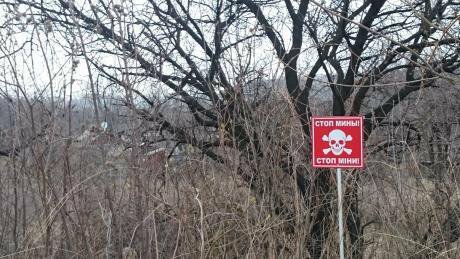 Luhansk landscape, 2017. Photo: Tetiana Goncharuk. All rights reserved.Another problem with this autonomy arrangement is that it may perpetuate the master cleavages that produced the conflict in the first place. I therefore suggest that we need to create a larger autonomy for each of the two Donbas provinces, rather than only for the separatist-controlled territories, as the Ukrainian authorities currently advocate. In so doing, we would dilute separatist sentiment in Donbas as a whole, since such an arrangement would include a significant share of people who, according to many recent polls, already identify themselves primarily with Ukraine. The second thing that I propose is to encourage the emergence in the region of what political scientists call “cross-cutting majorities.” That is, instead of creating a centralized regional structure with vast powers given to the executive leaders of the two provinces, we should envisage empowering local mayors or the heads of local village councils, for example, and allowing them to elevate the issues of people in each of these smaller regional units. These problems would certainly differ between different parts of Donbas, such that the master cleavage of Kyiv vs. Donetsk or Luhansk would no longer be relevant. This would produce fragmentation of Donbas along multiple issue dimensions and might help prevent regional collective mobilization in the future. Lipman: If I remember correctly, other key factors include converting rebels into legitimate actors, transitional justice, and also the issue of elections – you suggest in your article that elections should not be held straight away. Kudelia: The issue of guarantees to former rebels is the second most important question that we have to answer. Why? Because if separatist leaders and their subordinates feel that their livelihoods will be threatened by reaching an agreement, they will certainly act as spoilers – they will try to subvert the agreement by any means possible. One of the most common reassurance mechanisms is to allow these rebel groups to convert themselves into political parties, which would then be integrated in the political process on the local level. This means that they will be allowed to participate in local elections. Of course, they need to denounce violence, they need to give up arms, they need to completely demilitarize themselves, but if they feel that they have a future through the political process and will be guaranteed representation if they manage to win local elections, they will develop a stake in the agreement. It will give them a reason to both accept the agreement and participate in its enforcement. This is certainly a very difficult proposition for many Ukrainians today, because it means that separatist organizations that have long been characterized as terrorist groups in the national media and by Ukrainian officials would basically be recognized as legitimate actors. But since the start of the conflict, these organizations have developed genuine relationships with local residents through the provision of various social services, humanitarian assistance, and protection. As such, if they are banned or excluded, it will be very hard for Ukraine to create a stable and legitimate local government. The fourth and final issue is that of transitional justice. Over the course of the conflict, many members of the separatist government and of rebel groups may have committed various crimes, from embezzlement and extortion to war crimes. But in the majority of similar conflicts in the past, rebels received both comprehensive and unconditional amnesty. Again, this is a very difficult bargain for the rest of the society to accept. But the primary reason that most conflicts have ended with this type of bargain is because any attempts to investigate and prosecute individuals have inevitably led to selective justice (especially if only the rebel side is targeted), thereby undermining the peace process. Thus, the solution that many countries, including Guatemala and El Salvador, chose was to investigate and publicize the human rights violations committed by both sides during the conflict, but to hold their perpetrators responsible in the court of public opinion rather than in the court of law. Kudelia: Yes, truth commissions collect evidence and expose individual participation in crimes, but are not empowered to put these individuals in jail. It is a sub-optimal solution for many victims of these crimes or their families. But as far as achieving sustainable peace is concerned, this has been shown to be the most effective method. The recent peace agreement in Colombia created a novel accountability instrument – a special tribunal charged with investigating the gravest crimes, such as the kidnapping, killing, or torturing of civilians or prisoners of war. However, depending on the willingness of the accused to admit guilt and show contrition, this tribunal can issue sentences other than jail time, such as community service. This allows restorative justice to be achieved without threatening the stability of the peace. The effectiveness of this instrument has yet to be tested, since it has only recently begun to operate. Importantly, the Colombian tribunal can indict and investigate members of both pro-government and anti-government forces. Ukrainian society should be ready to accept the principle of blind justice in the event that a similar tribunal is created as part of the Donbas peace process. Kudelia: This assassination matters for a number of reasons. First of all, we have seen that in the four years since the beginning of this conflict, most of the insurgent leaders in Luhansk and Donetsk have been either assassinated or exiled to Russia, where they later died under suspicious circumstances. Valeriy Bolotov was exiled to Russia in August 2014 and died there under suspicious circumstances in January 2017. His successor, Igor Plotnitsky, was similarly exiled to Russia last year and we have not heard from him since. Many of the local commanders – Alexei Mozgovoy, Pavel Dremov, Batman, Givi, Motorola, and others – have been assassinated over the past three years. Their killings were never investigated. 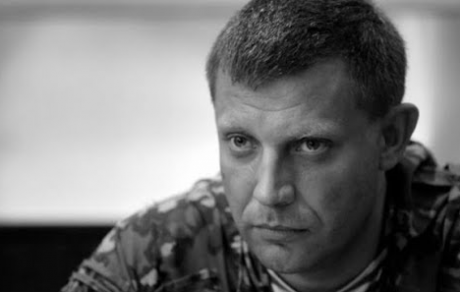 In Donetsk we have seen greater continuity in the case of Zakharchenko, and the fact that a figure of Zakharchenko’s standing has been assassinated shows that his successor will also become a potential target for assassination. Alexander Zakharchenko. Source: YouTube.This strategy, which may be characterized as a decapitation strategy, serves a number of purposes. First, it is used to send a signal to the leaders of these separatist organizations that they will never be safe as long as the conflict continues. The second goal of this strategy is to produce chaos in the rebel ranks, because the killing of a longstanding leader such as Zakharchenko triggers in-fighting over his replacement. Since there are no formal, open mechanisms through which for that succession to take place, it leads to fractionalization of the rebels themselves. And the more fractionalized they are, the weaker they are. So of course it is in the interests of the other party – in this case the Ukrainian government – to stick to decapitation; it actually works in the interests of Ukraine.But there is also a more strategic consideration. In the paper, I mentioned that one of the key difficulties with converting the rebels into political parties is the fact that some separatist leaders (like Zakharchenko) participated in the armed struggle, and this makes it very difficult for the Ukrainian side to accept them as negotiating partners or as future regional leaders. If you think about the Irish peace process, for example, it was Sinn Féin – the political wing of the Irish Republican Army, which was never involved in direct armed struggle – that represented the interests of Irish separatists in the talks with the British government. The fact that Zakharchenko was a soldier and military commander who fought the Ukrainian military on the battlefield of course made him completely illegitimate from the Ukrainian standpoint. His elimination therefore re-opens the path for civilian leaders to emerge, leaders who can be drivers of rebel conversion and therefore more acceptable to the Ukrainian side as counterparts in talks.